At the entrance to Shinjuku’s Golden Gai the leaves have yet to change colour but there is an aura of curiosity surrounding the woman who walks beside me. She walks slightly ahead, turning occasionally to smile as we glide along bar-lined passageways wide enough only for a single person to pass. Laughter emerges from cramped interiors. Some are dark, some garishly lit, some filled with cheap chandeliers and plush scarlet cushions. Some are so intimate it’s hard to even call them bars. They spill their clientele into the alley along which we walk, past Joy Division’s Love Will Tear us Apart, past the solitary drinkers, the wooden lattice windows, the salary men, the AC units, the lopsided neon signs, the loose electrical wiring, on towards a closed door with the name ‘Jetee’ written between two grinning cats on stilts. Behind the door is a set of steep, slender stairs. At the top is La Jetee. 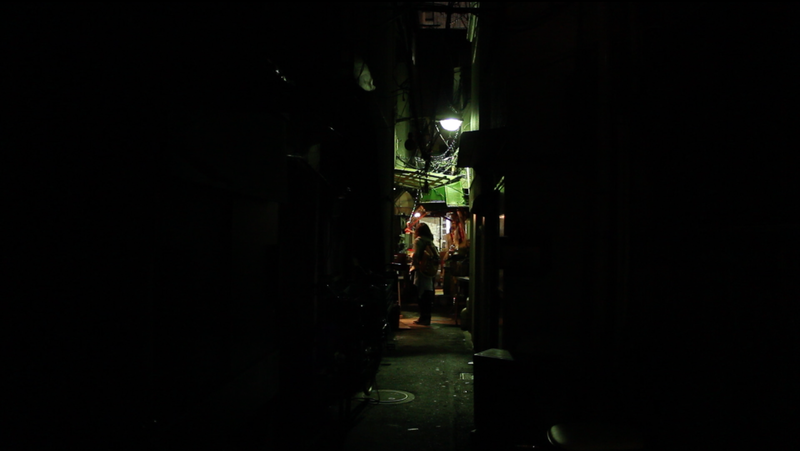 Golden Gai is an anomaly. A remnant of Tokyo’s post-war past. A labyrinth of counter-bars housed in a Japanese shanty town. They fit no more than five or six people – eight at a push – and each is barely a few feet wide. They have names such as Flapper, Death Match, YoYo and Slow Hand. There is one called Cambiare, inspired by Dario Argento’s 1977 psychedelic-horror film, Suspiria, and another named Tachibana Shinsatsushitsu, where a barmaid wearing a nurse’s uniform serves food in hospital kidney dishes. Most, if not all, have a theme of some sort. Behind the bar at La Jetee is Kawai Tomoyo, the Jean-Luc Godard-loving proprietor. Around us, wooden walls are plastered with movie posters and shelves stacked with old cassette tapes. A group of French speakers sit at a solitary table. We squeeze in beside the bar, opposite stacks of CDs and bottles of half-drunk Japanese whisky with their owners’ names scribbled across them. One is Lebanese and has a name written on it in Arabic. The director Yasujirō Ozu used to drink here. So did Wim Wenders, who filmed a documentary about Ozu in the early 1980s and shot a scene at La Jetee. If you swung a cat, the chances are you’d demolish the place. Golden Gai is part Bohemian hangout, part hovel. The kind of place I imagine the author Haruki Murakami would avoid. Yet wider Shinjuku plays a sizeable role in the work of Japan’s most distinguished writer. Murakami always made Tokyo seem easy. He turned the city into people and stories; into elements of existence. He broke down Tokyo into jazz clubs and book stores, restaurants and bars, but most importantly into people. His maps were always human, not geographic. Tokyo was simply fragments of an imagination. Many of those fragments can be found in Shinjuku – in the university where he studied, in the books that he wrote, in the jazz clubs that he made his home. In Kabukichō, Shinjuku’s neon-fuelled red light district and ‘sleepless city’, are passageways no wider than the span of my arms. The buildings on either side have laid themselves almost completely bare. Electrical boxes, industrial piping, ventilation units, shutters, snake-like wiring and the occasional metal door line the walls, while short bursts of covered walkway have been stitched together with angle iron and odd bits of corrugated sheeting. A few metres in, a Chinese kitchen has emptied its stomach. Shelves of crockery sit opposite wash basins and colourful childlike mannequins, while trays of food are fed from person to person. Up ahead a large group of diners has arrived. We peep in through a tiny window in the wall. Shinjuku’s alleys and passageways are wonderful – a snapshot of an older, less sterile world. They pepper the city, running like capillaries from one neon-lit limb to the next. They are symptomatic of the inseparable nature of mess and order in Japanese culture and the wholesale redevelopment of Tokyo since the war. Golden Gai and the passageways of Kabukichō lie between the fault lines of the city’s transformation. So too the rickety eateries and bars of Omoide Yokocho, crammed between the railway tracks of Shinjuku Station and the Ome-kaido highway. They are packed with hole-in-the-wall bars and restaurants and informal drinking dens serving chargrilled meats and vegetables by the skewer. Somewhere nearby, on Yasukuni Dori, we search for Dug, the jazz club featured in Murakami’s Norwegian Wood, but we never find it. We never find Midori either, her chin cupped in her hand and her elbows resting on the bar. Nor do we find Watanabe and Thelonious Monk’s Honeysuckle Rose. We wander back to Kabukichō. The predominant colour is fluorescent white but there are pinks and oranges and yellows too. They are extreme versions of their own hue; loud and obnoxious and blinding if stared at for too long. We walk past venues of indeterminable nature, where rows of gold-leafed armchairs face one another across flamboyant floors and chandeliers of pink and gold-tinted glass hang from ornate ceilings. We are watched over by giant video screens and girls with large Anime eyes. They are mesmerising, those enormous, tinted doll-like eyes. They see everything: karaoke joints, hostess clubs, love hotels, manga cafes, gaming arcades, venues of indecipherable purpose, all packed into this hyperactive network of psychedelic streets. People flow past in waves. “Even at a time like this, the street is bright enough and filled with people coming and going – people with places to go and people with no place to go; people with a purpose and people with no purpose; people trying to hold time back and people trying to urge it forward,” wrote Murakami in After Dark. At Hinai-tei, a restaurant just up and west of Shinjuku Station, a friend introduces us to okonomiyaki, a savoury pancake filled with eggs, meat, cabbage and cheese. There is a sweet sauce drizzled across it like the decorations on a cake and we wash it down with selections of cold sake. Tokyo is often too vast to comprehend. Too puzzling. Shinjuku Station alone is the busiest place of its kind of earth. Thirty-six platforms, 200 exits and a further 17 platforms accessible via walkways to five connected stations are indicative of the city’s unparalleled mass transit system. The Yamanote Line is our lifeline. It loops around central Tokyo and lassos the inner city into a navigable entity, running through Shinjuku and linking it to Akihabara, Ueno, Shibuya and Shinagawa, four destinations we set off to during the course of our stay. To the south of the station lies Takashimaya Times Square, to the north-east discount chain store Don Quijote and the land of glitter and sequins. Literally next-door to the east exit is the Old Blind Cat jazz bar, where Murakami spent hours and hours whilst a student at Waseda University. A few blocks away is the home of Japanese bookseller Kinokuniya, where novels and magazines and comics are spread out over eight floors. “When I thought about sitting down at my desk at home and setting out to write I realised I didn’t even own a decent fountain pen,” wrote Murakami in What I talk About When I Talk About Running. “So I went to the Kinokuniya store in Shinjuku and bought a sheaf of manuscript paper and a five-dollar Sailor fountain pen. A small capital investment on my part.” With it he wrote his first novel, Hear the Wind Sing. On our last night we escape the claustrophobia of our hotel room in Kabukichō and head across town to Yurakucho and The Peninsula. Even here the alleys of Tokyo are evident and small spaces thrive in the gaps between larger structures. Many have colonised the spaces under bridges and railway tracks, including Yakitori Alley beneath the Yamanote Line, and another, its name unknown, wallpapered entirely in old Japanese movie posters. The contrast between the hotel and Kabukichō is immense. At the latter we ate four dollar meals from automated restaurants, here we dine on wagyu beef and champagne. Where once we slept in a box, now we sleep in a lavish suite with a bathroom and spa larger than most Tokyo apartments. There are red spiral installations suspended in space between hallway walls, lights of fuchsia, dressing rooms, and fruit custard burger desserts. That evening we head to Peter, a grill restaurant occupying the entire 24th floor of The Peninsula hotel. The Imperial Palace Gardens and Hibiya Park lie below and we stand and stare at the 180-degree views afforded of the Tokyo skyline. It is beautiful. “What happens when people open their hearts?” asks Watanabe of Reiko in Norwegian Wood. “They get better,” she says. I am in love with your writing. Thank you!